Lenovo has launched it’s war horse to rule the budget phone market in Indian and China. 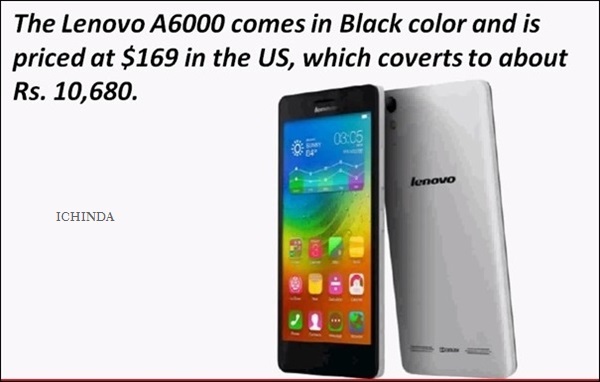 I am talking about the all new Lenovo A6000 4G LTE smartphone with 64-bit quad-core Qualcomm Snapdragon 410 launched at CES 2015 priced at $169(Approx Rs 10,500). Lenovo A6000 slated to launch on 16th Jan in India through Flipkart priced under Rs 10,000 to take on Xiaomi Redmi Note 4G(Rs 9,999) and Micromax’s Yu Yureka(Rs 8,999). While Micromax Yu Yureka(AO5510 launched at priced at Rs 8,999 in Moonstone Grey color which supports Dual-SIM((4G+3G)),Micro SIM, Bluetooth 4.0, Micro-USB, Wi-Fi 802.11 b/g/n, GPS, and a 3.5mm audio jack comes with a bigger 5.5-inch HD IPS display with resolution (720×1280 pixels) and a pixel density of 267ppi with Gorilla Glass 3 protection operating speed is Cat. 4 4G LTE with up to 150Mbps download speeds and 50Mbps upload speeds runs on latest Cyanogen OS, Cyanogen OS 11 based on Android 4.4 kitkat and Android 5.50 Lollipop powerful 64-bit 1.5GHz octa-core Snapdragon 615 SoC (MSM8939) processor with 2GB RAM, 16GB internal memory and 32GB Expandable memory sporting a 13-MP rear Auto focus camera with LED Flash, Sony Exmor CMOS sensor and 5-MP front facing camera packed with a 2500mAh Li-Po battery promising talk time up to 8 hours, standby time up to 310 hours, video playback time of up to 6 hours, and gaming up to 4 hours measures 154.8x78x8.8mm. Xiaomi Redmi Note 4 Launched at Rs 9,999 which supports Dual- SIM with Dual-Mode(GSM+WCDMA) offers connectivity through 4G LTE, 3G, NFC, Wi-Fi, Bluetooth, USB and GPS comes with a bigger 5.5-inch full-HD LCD display with resolution (720×1280 pixels) and a pixel density of 441ppi and With Glass-film-film (GFF) architecture runs on tweaked version of the Android 4.4 kitkat dubbed MIUI version 6 powered by 1.7GHz octa-core MediaTek MTK6592 SoC Processor with 2GB RAM, 8GB internal memory and 32GB expandable memory combines 13-MP Primary rear camera with dual-LED flash, Sony’s stacked CMOS sensors(f/2.2 aperture) and 5-MP front facing camera packed with a 3100mAh Li-ion battery promising Stand by time up to 775 hours and Talk Time up to 38 hours measure 154mm x 78.7mm x 9.45mm weight 199gm. At last few honest word from hearts, new Lenovo A6000 will give stiff competition to Xiaomi Redmi Note 4G and Micromax’s Yu Yureka in India. What you think? Please be first to write a review.